Aaptiv’s Sleep Better program includes seven classes led by meditation and mindfulness expert Jade Alexis. On day one of the program you’ll begin with ten minutes of relaxation and focus on your breath. As the week progresses you’ll graduate to a 30-minute session and incorporate techniques that train your body to release tension and prepare for deep sleep including breathwork, body scans, and yoga nidra - a type of meditative state achieved before sleep. This program is designed to be taken as many times through as you wish and can be referred back to as often as you need. too many quick variation of background noises. the breathing exercises are going too fast. the lady speaks in a stressful and quick way instead of being assertive and calming. The aid helped me sleep, but I had to get used to the voice for this one. Not a good fit. 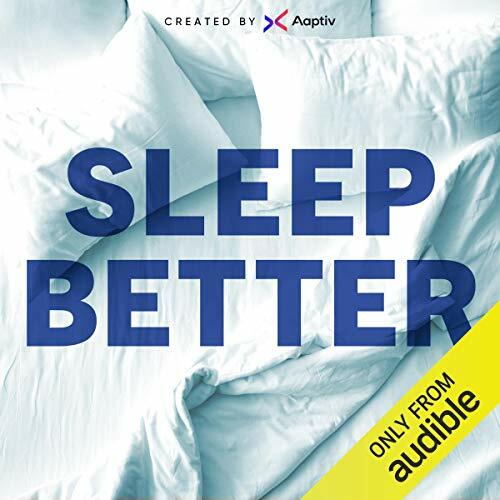 I love these bedtime meditations...they truly help me fall and stay asleep...I have had problems sleeping for years and this is the thing that works for me. If possible Please remove the This is Audible at the end it is not necessary and actually startled me the first time....not a criticism, just an observation and recommendation. It really worked for me, it helped me relax and fall asleep right after. The program teaches you something new every day, but you also repeat what you previously learned. So you end up having a nice routine to put in practice when you can't sleep. The narrator was perfect, she had a calming voice. Apparently they removed the final "This is audible". So you will only hear it at the beginning, which is not so disturbing. In order to listen to more than one track , I tried to use the function of the player that supposedly allows you to play the various parts of a book without stopping, but it is not working in this case. If you want to do so, you have to manually load the next track. My entire family benefited from this. My 10 year old typically needs melatonin to get to sleep in less than an hour. The first day he needed 2 sessions. The 2nd day, most of 1 session, and thereafter about 5-10 minutes. That said, we had to listen at .75x speed. Ms. Jade goes at a speed and pitch you’d expect as part of a light stretch and meditation at the end of a group workout...not a speed/pitch conducive to sleep. It was off-putting at first until we figured out that we could slow her down. I have been doing these sessions at night for the past few nights and am sleeping like a log. They work great and help get me to relax before bed. My husband usually starts snoring half way through them. They are great! Totally recommend!